Sea monsters are sea-dwelling mythical or legendary creatures, often believed to be of immense size. Marine monsters can take many forms, including sea dragons, sea serpents, or multi-armed beasts. They can be slimy or scaly and are often pictured threatening ships or spouting jets of water. 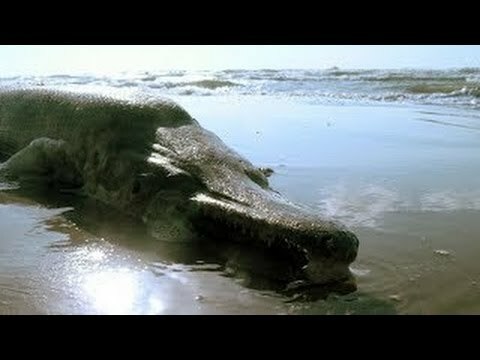 The definition of a “monster” is subjective, and some sea monsters may have been based on scientifically accepted creatures such as whales and types of giant and colossal squid. Historically, decorative drawings of heraldic dolphins and sea monsters were frequently used to illustrate maps, such as the Carta marina. This practice died away with the advent of modern cartography. Nevertheless, stories of sea monsters and eyewitness accounts which claim to have seen these beasts persist to this day. Such sightings are often cataloged and studied by folklorists and cryptozoologists. Sea serpent reported by Hans Egede, Bishop of Greenland, in 1734. Sea monster accounts are found in virtually all cultures that have contact with the sea. For example, Avienus relates of Carthaginian explorer Himilco’s voyage “…there monsters of the deep, and beasts swim amid the slow and sluggishly crawling ships.” (lines 117-29 of Ora Maritima). Sir Humphrey Gilbert claimed to have encountered a lion-like monster with “glaring eyes” on his return voyage after formally claiming St. John’s, Newfoundland (1583) for England. Another account of an encounter with a sea monster comes from July 1734. Hans Egede, a Dano-Norwegian missionary, reported that on a voyage to Gothaab/Nuuk on the western coast of Greenland he observed: a most terrible creature, resembling nothing they saw before. The monster lifted its head so high that it seemed to be higher than the crow’s nest on the mainmast. The head was small and the body short and wrinkled. The unknown creature was using giant fins which propelled it through the water. Later the sailors saw its tail as well. The monster was longer than our whole ship. Other reports are known from the Pacific, Indian and Southern Oceans (e.g. see Heuvelmans 1968). There is a Tlingit legend about a sea monster named Gunakadeit (Goo-na’-ka-date) who brought prosperity and good luck to a village in crisis, people starving in the home they made for themselves on the southeastern coast of Alaska. A more recent development has been the two mysterious noises “Bloop” and “Slow Down” picked up by hydrophonic equipment in 1997 and not heard since. While matching the audio characteristics of an animal, they were deemed too large to be a whale. Investigations thus far have been inconclusive. It is debatable what these modern “monsters” might be. Possibilities include the frilled shark, basking shark, oarfish, giant squid, seiches, or whales. For example Ellis (1999) suggested the Egede monster might have been a giant squid. Other hypotheses are that modern-day monsters are surviving specimens of giant marine reptiles, such as an ichthyosaur or plesiosaur, from the Jurassic and Cretaceous Periods, or extinct whales like Basilosaurus. Ship damage from Tropical cyclones such as hurricanes or typhoons may also be another possible origin of sea monsters. In 1892, Anthonie Cornelis Oudemans, then director of the Royal Zoological Gardens at The Hague saw the publication of his The Great Sea Serpent, which suggested that many sea serpent reports were best accounted for as a previously unknown giant, long-necked pinniped. It is likely that many other reports of sea monsters are misinterpreted sightings of shark and whale carcasses (see below), floating kelp, logs or other flotsam such as abandoned rafts, canoes and fishing nets.